Micro SD card is widely used on Android devices in order to extend the device’s storage space, but what we fail to consider is one day the SD card may get damaged and the Android does not recognize the SD card which is filled with our valuable data, such as family photos, funny videos and other important files. Actually, it’s quite a frequent case. 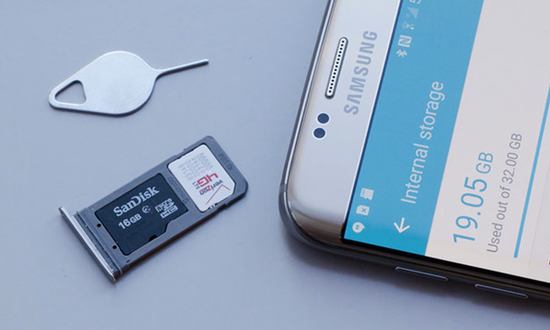 In the following article, we explore some of the major reasons why micro SD card is not detected on Android, and suggest the solutions to fix it on your phone/tablet of Samsung, LG, Sony and etc. “My Samsung Galaxy Tab A is not recognizing the SD card. What’s wrong with my tablet, or my SD card stopped working anymore?”, said Anne. If you face similar issue like Anne’s, you should run a test to work out whether your SD card is broken or still working before moving to the next section to fix the SD card error. To determine that, you’ll need to insert the card into the computer via the SD card slot or with the help of a SD card adaptor. If the SD card is still working, it should appear on the “My Computer” window. If the SD card is not showing up on computer, it is most likely broken and you have to buy a new one. By the way, if the SD card is detected by the computer as well as other Android devices, then it is the problem of your phone, and you should send your phone to repair. Why My Android Phone Won’t Read My SD Card? Reason 1. SD card isn’t compatible with your Android. Your new SD card won’t be read on your phone and you can see the system message showing “SD card not inserted”. That’s mainly because your mobile phone doesn’t support this new card. If your card uses unknown specifications or the capacity of the card is too large, mobile phone may not recognize it as a memory device. Check your phone’s manual and get an SD card that is compatible with the system requirements of your phone. Reason 2. Outdated SD card driver. Because of the outdated driver, your Android phone or computer may not be able to recognize the SD card properly. Connect memory SD card to your PC, right-click on the “My Computer” icon and choose “Manage”. In the task bar on the left, click “Device Manager” and click the “+” next to “USB Serial Bus controllers”. Then you’ll see a yellow exclamation mark. 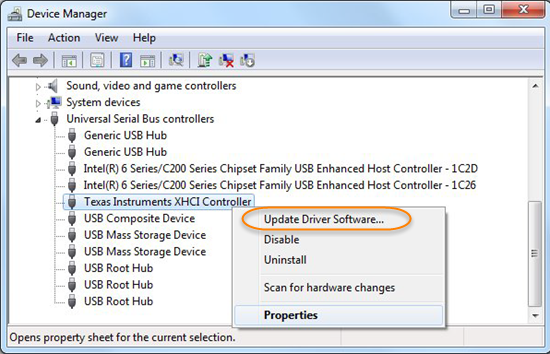 Right click on your SD card and choose “Update Driver Software”, then click “automatically search for updated driver software”. Now what you should do is to wait patiently and let the driver to be installed and reboot your computer. After that, try to reconnect the SD card to computer and to check if it can be detected. Reason 3. Wrong file system format. Check the size of your SD card, and if the capacity of it is over 32 GB, it is likely to have been formatted to exFAT file system, which is not supported by some Android versions. 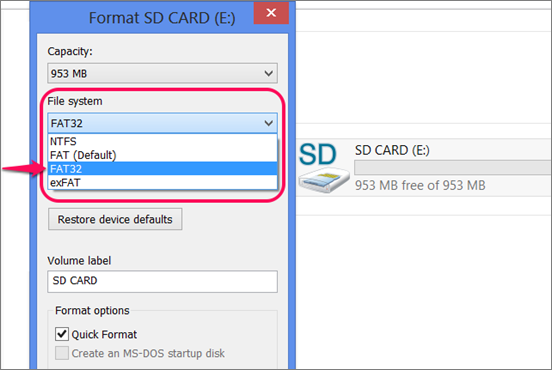 You need to format the SD card to the file system that your phone supports. Using computer is the easiest and safest way for inexperienced users to format micro SD card for Android. You’ll need a card reader card adaptor that will help you insert the memory card to computer properly. Then go to My Computer > Right-click on the SD card > select Format. After that set the file system label to FAT or FAT32 for your SD card and click OK. In order to get through the pain of SD card data loss after formatting, it is strongly recommended that you should hurry to recover data from micro SD card which is not detected on Android mobile. And if your WhatsApp media files are missing from SD card, you should follow this guide to get them back. If you use a bought battery instead of the official battery in your Android, it may cause the “SD card not detected on Android” error. As some good quality SD cards need stable power supply, while the bought battery could not give the card the power which supports the card to run efficiently. You should replace your bought battery with an official one. Reason 5. SD chip or SD card slot is dirty. Sometimes, your micro SD card and the card slot may be dirty and covered with dust. In this case, it will be difficult for the Android phone to recognize the SD card properly. Turn off your Android mobile phone and unmount the SD card from Android. Then gently wipe your SD card and the card slot with cleaning alcohol or water. And remember not to plug it back into your phone until it gets dry completely. We hope that these tips could help you fix your SD card not detected problem. If you have any question or suggestion, please feel free to comment below and we are always glad to help you!